> Insight > IT pros, forge your path to workforce freedom. The workforce has gone full-blown digital. It’s dispersed. It’s always connected. But as IT budget and bandwidth dwindle, IT’s role as the gatekeeper of work experiences has become more complex than ever. 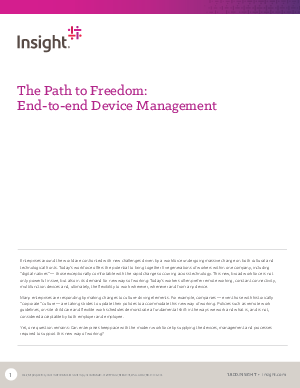 End-to-end device management is becoming a powerful way to address these challenges. Learn about workplace disruption, the evolution of work devices, and ways to provide superior support through Device as a Service solutions.